If you would like to submit photographs, or memories, please send them to the NEWTON COUNTY COORDINATOR. Front row - Ed Bushman, Ron Wilson, Dave Henderson, Keith Nuest, & Chet Kwiatkowski. 2nd row - Terry Henderson, Lynn Brown, Ron Madison & Rudy Watkins. Front Row-Ina Sapp, Connie Brown, Ed Bushman, Dave Henderson, Chet Kwiatkowski, Charlie King, Ruby Slayton & Opal Winkley. 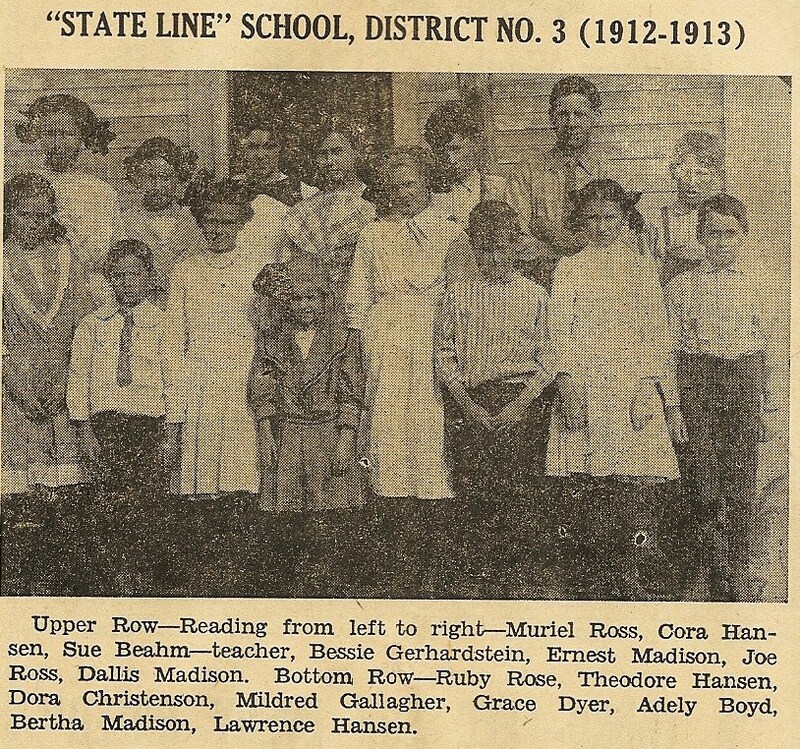 Row 2 - Keith Nuest, Shirley Brownfield, Jackie Hayes, Edna Merrill, Melody Collard, Rudy Watkins, Nancy Bushman & Ron Wilson. Row 3 - Mr. Glenn Arbuckle, Terry Henderson, Bob Speer, Dennis Boyd, Larry Voyles, Walt Zelivetz, Ron Madison and Jack Taylor. Photo contributed by Georgia M (Crowell) Vallejos. 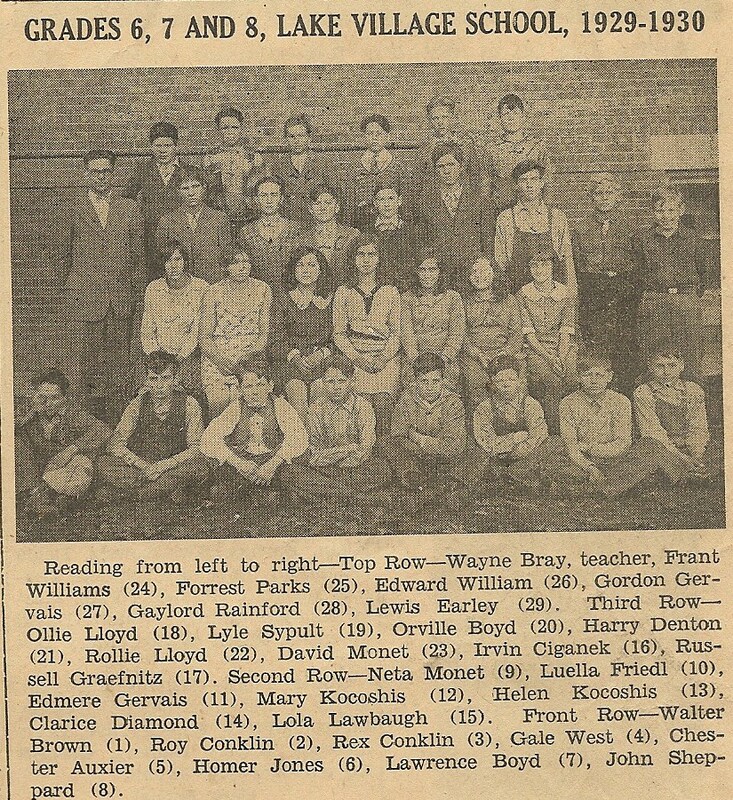 Fourth Row: Walter Martin, Judy Brown, Peggy Bigger, Wiley Stone, Alice Bradburn, Chuckie Cain, Betty Eaton, Brenda Bigger. 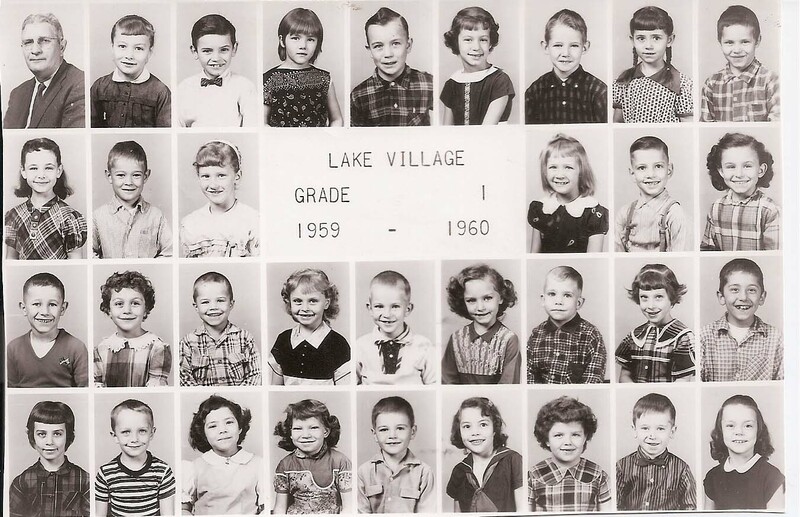 Some of the kids in my class were Dolly Allison, Wiley Stone, David Page, Alice Bradburn, Penny Dawson, Vance Myers, Christine Henderson, Josephine Steele, Chuckie Cain, Brenda Bigger, Eugene (? ), David Page, Judy Brown, two different Debbie’s and my best friend Betty Eaton. The cafeteria ladies were farmer’s wives from around town, and they put up a real farmer’s lunch – all made from scratch. Buttered squash, fried chicken, green beans, rhubarb cobbler with rhubarb from their own gardens. Amazing. I work at a school in Utah, have been here for 20 years, and all they get in the cafeteria is burgers, pizza, tacos and hot dogs. Yuck! I remember when they had the elections in the gymnasium that made JFK president. Also remember the day he was shot. 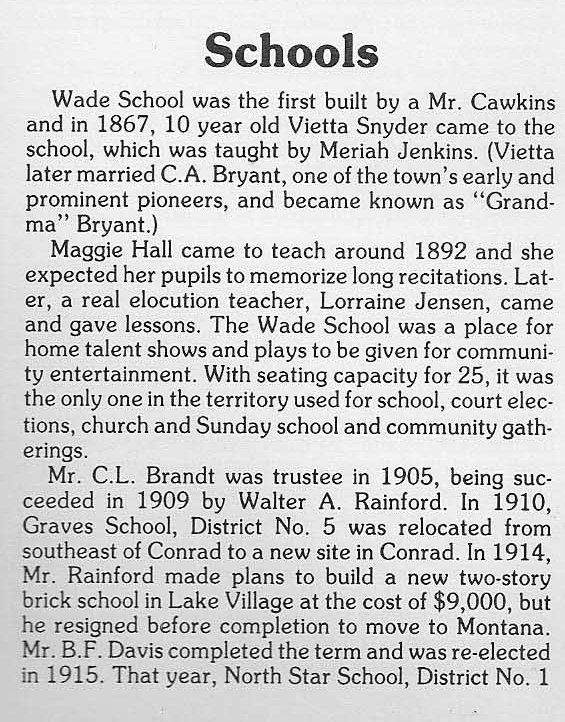 We were in the new building then – I was in 5th grade. 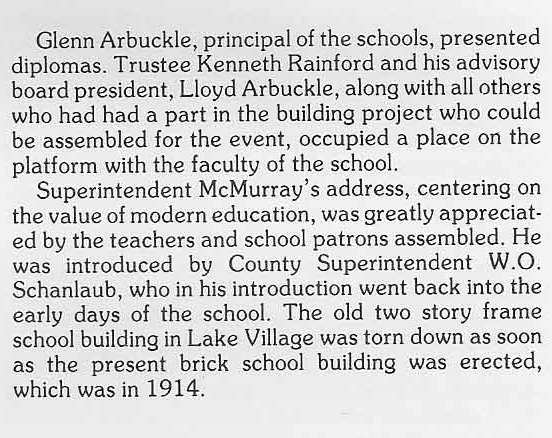 Mr. McDonald was principal. I swear he looked and acted just like Don Knotts. He went from room to room and told us the news, then had us all bow our heads for a moment of silence. Then he dismissed school and had the busses take us home. On bad days, they took us to the gym for recess, where we just ran around like madmen. The gym was heated with these big air ducts built into the walls. Our favorite thing to do was to sit in them (which they allowed) and climb up into them (which was not allowed.) One air duct could hold 4 to 6 kids. All the kids in my class played together at recess – boys and girls. We played baseball, dodge ball, red rover, statues, easter eggs, and sometimes my little group of friends played a game called babysitter that one of the girls taught us. We played it on the cement slab just below the bell. It went like this; one girl was the mom, one was the babysitter, one was the witch, and the rest were the children. It was a modified version of easter eggs. The mom would say to the witch “I’m going downtown to smoke my pipe, I won’t be back till Saturday night, if you let the old witch in, I will chop your (head, leg, arm) off!” Then the witch would come in and if she got through the babysitter, the kids would run. Whoever the witch caught would be “out” and the babysitter would lose whatever member the mom had said. The game was over when all the kids were caught, or the babysitter ran out of limbs. Anyway, one week we had been playing this game every day, but one particular day I stayed home sick. That day, when they rang the bell for recess, the bell fell from the tower and came crashing down on my friends! Luckily they scattered and it missed them, but I wonder if I would be alive today if I had gone to school that day. In the winter the boys made snow forts across from each other and had snowball wars. The girls provided ammunition and played nurse to the wounded. 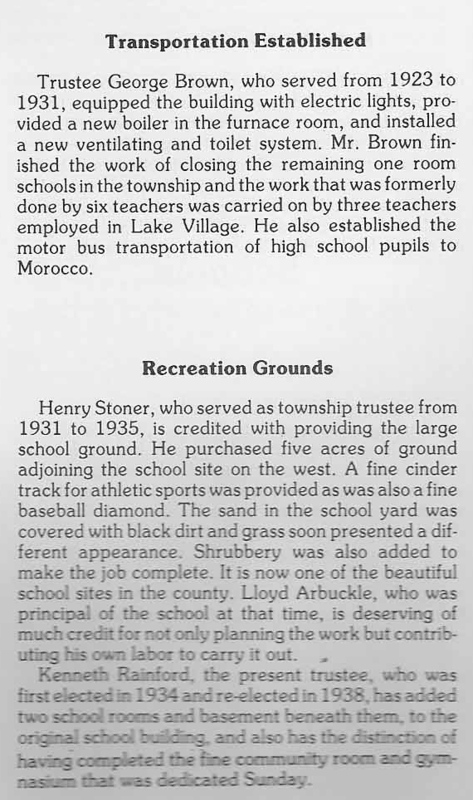 On a more interesting note – when the community started pushing for a new school, the school board and old timers in the town fought against it tooth and nail. 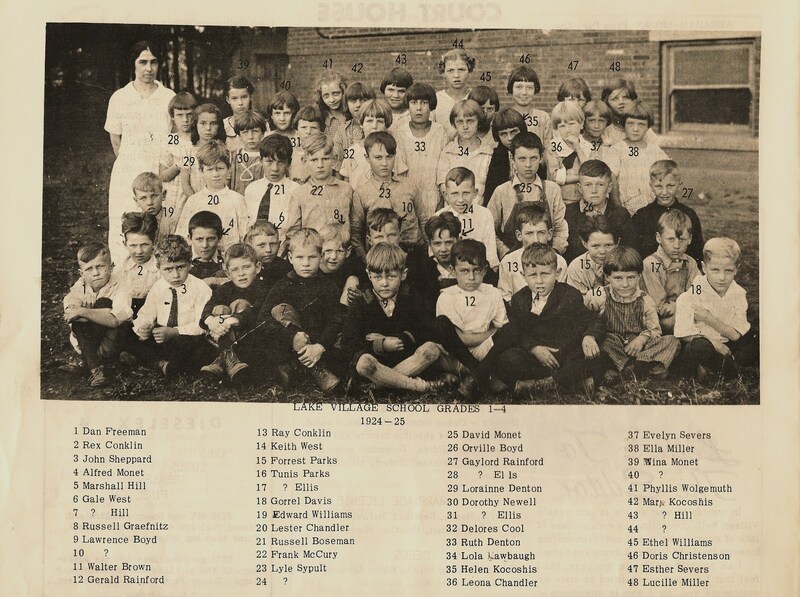 Most of the older people had gone to the old school, as had their parents and grandparents. It was a bitter fight! The old school’s plaster was falling from the ceiling, and I guess a chunk of it just missed some kids. There were gaps in the hardwood floors upstairs. The big kids started a rumor that there was treasure hidden in the ceiling, and to convince the little kids that it was true, they would drop pennies through the cracks. 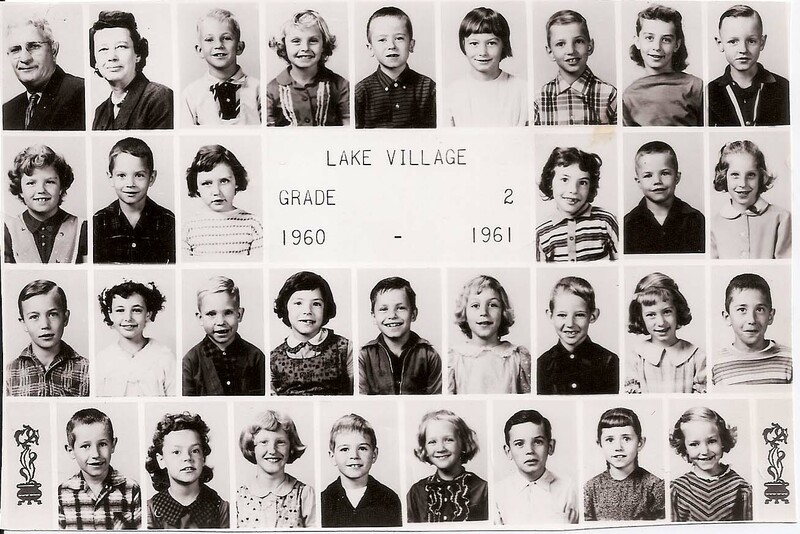 It was a real culture shock when we moved to Cedar Lake in the middle of my 6th grade. The kids there were so mean, rude, and hateful compared to the nice farm kids that I was used to. 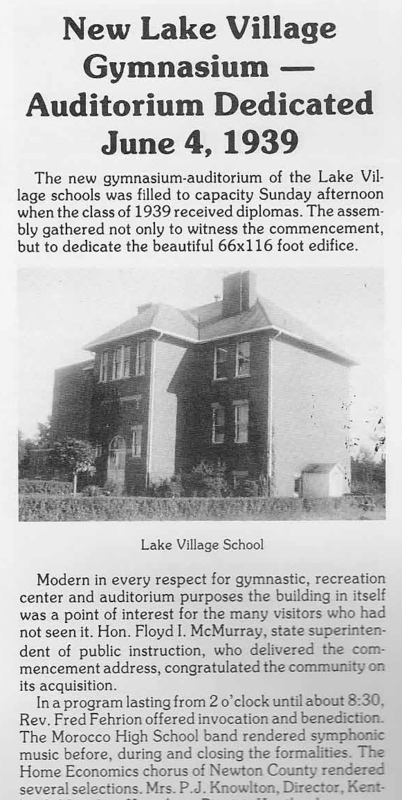 A bit of history on the Lake Village School, reproduced from the "History of Newton County, 1985"